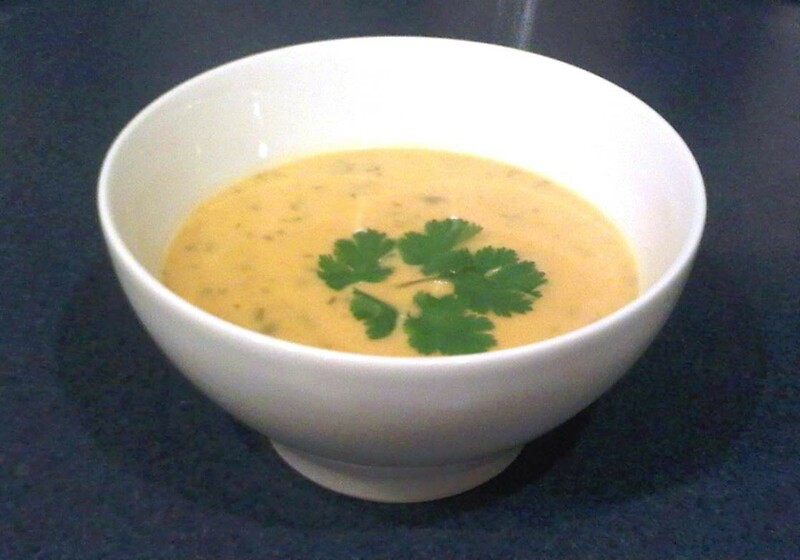 My Halloween pumpkin turned into something delicious…Creamy Coconut Pumpkin Soup! Each year in my neighbourhood, a local realtor and her team does a food drive for our city’s food bank…and in exchange for a bag of non-perishables, gives out a pumpkin. In my quest to find another use for the annual Halloween Pumpkin (other than just for a jack-o-lantern or pumpkin pie), I decided on making a Creamy Coconut Pumpkin Soup. DH gave it two thumbs up…he noted that the heat is subtle, but creeps up on you after the first couple of slurps. 2. Peel the pumpkin and set aside the seeds (these are great for roasting later). Cut the pumpkin into 1/2 inch cubes. You should have around 4 1/2 to 5 cups. 3. Toss the cubed pumpkin and the peeled shallot with 2 tbsp oil, place on a baking sheet in a single layer and roast in the oven for 40-50 minutes. 4. Place the shallots, pumpkin cubes, coconut milk, broth, cilantro leaves, Thai red curry paste, sugar and kaffir lime leaves in a large pot and bring to a boil. 5. Add the salt and simmer over medium heat until the pumpkin is tender, about 10 minutes. 6. Stir in the fish sauce and cook for another 2 to 3 minutes. Taste for seasoning, adding more salt and/or fish sauce if desired. 7. Remove Kaffir lime leaves. 8. Blend with immersion blender. 9. Let the soup stand for an hour (it tastes better if you do this step, but you can always eat it right away if you’re greedy), reheat just before serving. 10. Serve – grinding black pepper generously over soup.